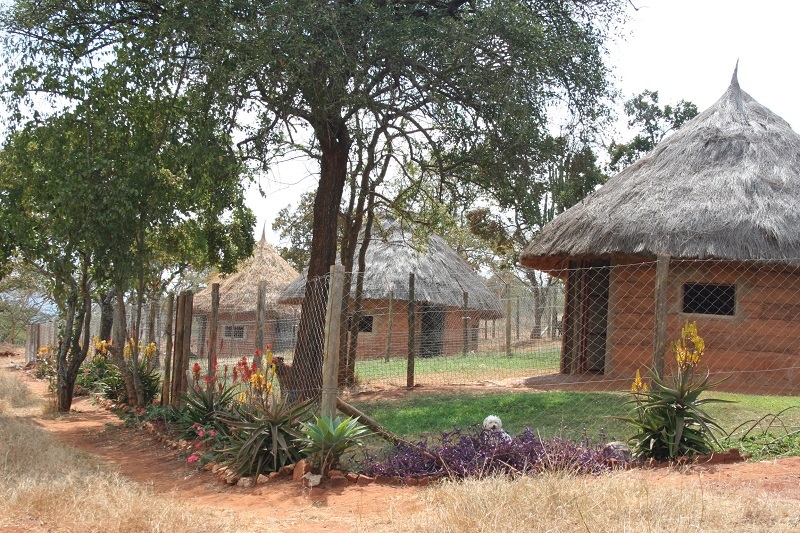 Each ‘block’ is made up of a thatched rondavel house divided into 4 spacious kennels. 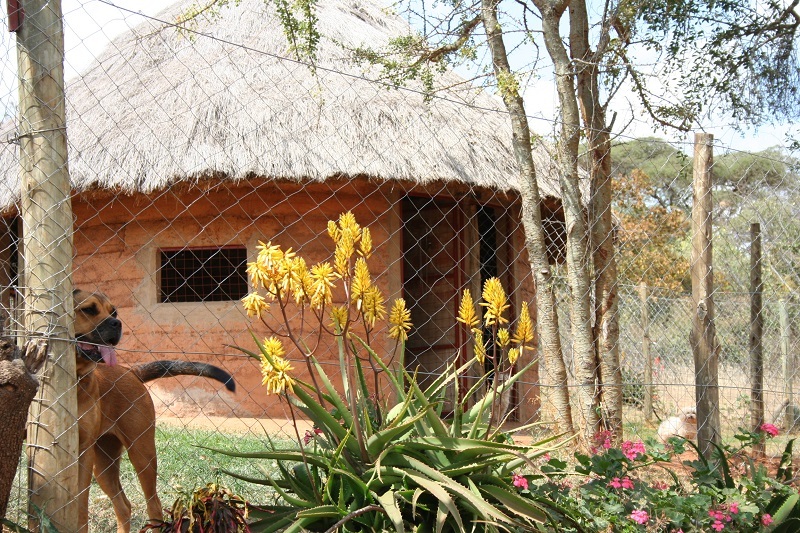 The thatching ensures that the kennels are cool during the day but warm at night. Each kennel has an inside sleeping area measuring 5M squared, and an outside grassy lawn area measuring 9m x 9m with a tree in each – this means there is some shade throughout the day. Each kennel is spacious enough such that dogs from the same “family” can share thus avoiding the stress of separating them. Dog baskets and blankets are provided as bedding however, where possible owners send their pet’s own blanket to make the dog feel more at home in their “own bed”. A nutritious diet formulated by BEWI (imported from Germany)is fed twice a day to suit each pets requirements. Fresh farm milk is given on a daily basis if the pet is allowed. Each kennel is cleaned and disinfected regularly. 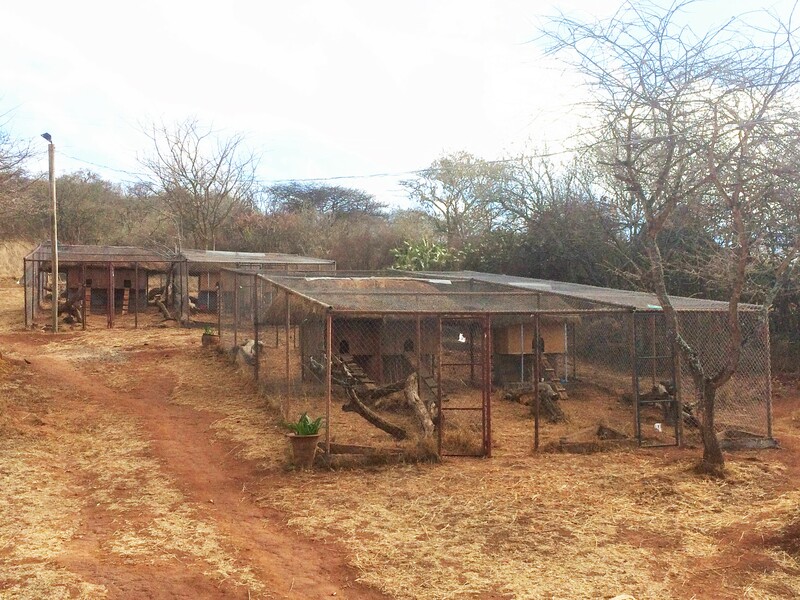 Each enclosure has it’s own private thatched wooden sleeping box raised off the ground and accessible by a rustic ladder. The enclosure measures 2.5m(W) x 6m(L) x 2m(H). There are tree stumps and branches for the cats to climb on and rub themselves against. A large, natural outdoor ‘litter’ corner is set away from the sleeping area and the sand changed regularly. A choice of imported tinned food and nutritious cat biscuits are provided.